Since I’ve added an extra day into my work days I have struggled to find time to catch up with my friends and subsequently my Muddy Kids have also missed out with only a small amount of spare time to fit in a long list of things. 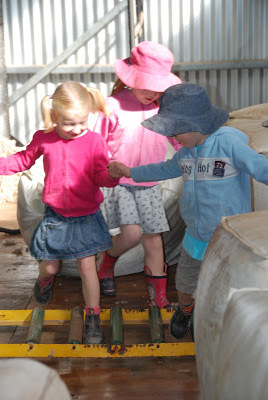 These school holidays thought I’ve tried to make a conscious effort to let my Muddy Kids get some quality friend time in. We’ve had sleepovers and play dates and netball clinics. All things that would normally have to slip by the wayside. It has been so delightful for my two big Muddy Girls to go on a sleepover together and see how much fun they had, my wonderful friend made snow globes with them and let them watch a movie and have a spa. 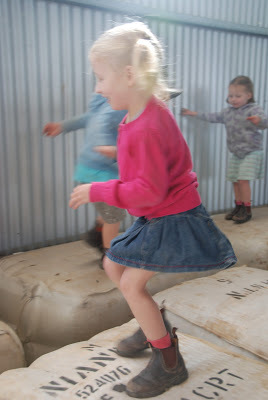 We had the Muddy Pixie’s bestie over for a play and they had so much fun playing in the wool shed, jumping on the wool bales and playing hide and seek in the sheds. 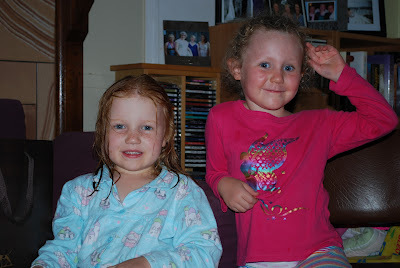 We even braved the world of having a friend for a sleepover and it was lots of fun. Not only has it kept the kids entertained and they are falling into bed exhausted each night but the smiles on their faces and the joy it brings me lets me know it’s worth the effort. So this week I am grateful for my Muddy Kids friends for being so special and bringing such lovely friendships into their lives. 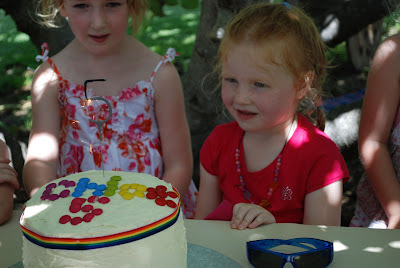 Linking up over at Village Voices for 52 Weeks of Grateful, hosted by the lovely Bron. 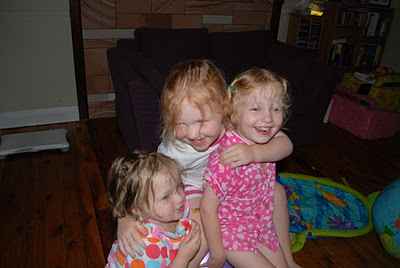 This entry was posted in 52 Weeks of Grateful, Kids Play, Photos, Sisters on April 21, 2013 by nat. I am an only child, my mum said ‘a smart woman never forgets the pain of childbirth’ and decided that one was enough for her. Mum said I only ever asked once for a brother or sister, other than that I was content. Happy to play with close family friends who were like sisters and then I have my BFF who is like my sister from another mother. I never wanted, I had good friends and a loving family. 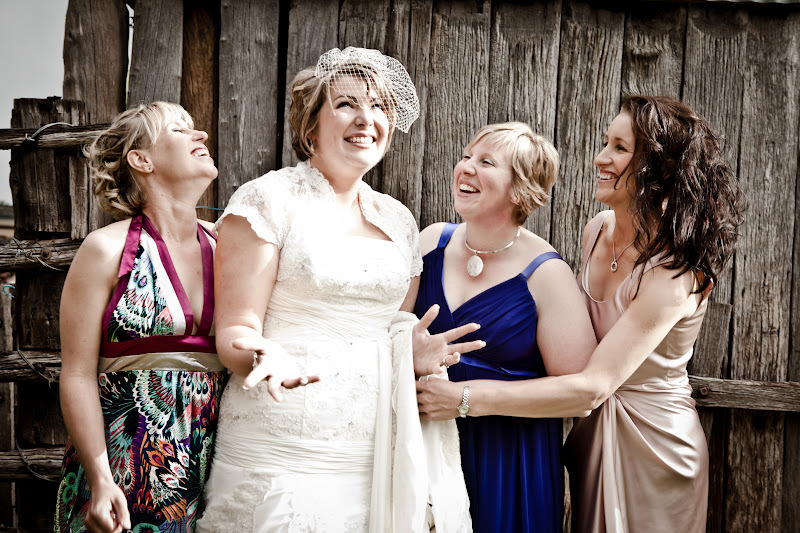 Then I married into a large family (well large by my only child standards), Muddy Hubby has 2 sisters and 1 brother. 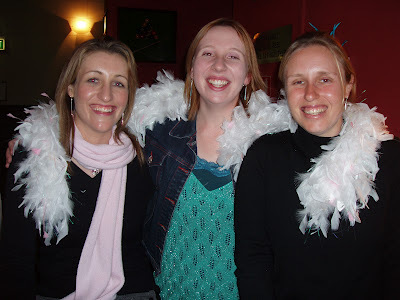 Just before I got married my 2 sister-in-laws gifted me with a lovely photo frame with the heading ‘Sisters’ on it, they made it quite clear that they didn’t wanted to be treated as ‘sister-in-laws’ they wanted to be ‘sisters‘. I have never forgotten and it has always been that way, we have talked and fought and cried and laughed together. Last year my Muddy brother-in-law got married, he married the most wonderful girl and we enveloped her into our family fold as another ‘sister‘ despite the fact that she already had two sisters of her own. This week I am so grateful for all of my sisters. I was in desperate need of a babysitter so I could go to Boot camp this week and one of my sisters stepped in. 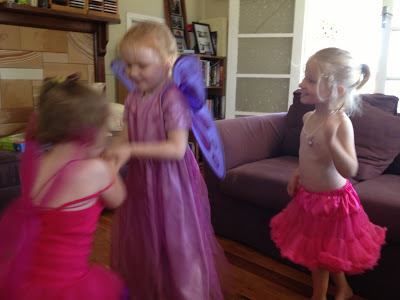 We’re throwing a big party here today and surprisingly it has so far been stress free. We have divided up the tasks amongst ourselves, cake with one sister, lunch with another and venue, dessert and lolly bags with me. All sorted thanks to my wonderful sisters. It is only in the last few years as my parents begin to age a little and I have had children of my own that I have had a real yearning for my own sister, someone to share the load with and confide in. My sister-in-laws have been so wonderful in stepping in to fill this void that I only get an occasional pang for a sister of my own blood. For now though I am very grateful for my BFF (sister from another mother) and my ‘Sisters’ and their helpfulness that gets me through a week with a little less stress and some time for boot camp. October 2011 where we got an updated photo for my ‘Sisters’ frame. 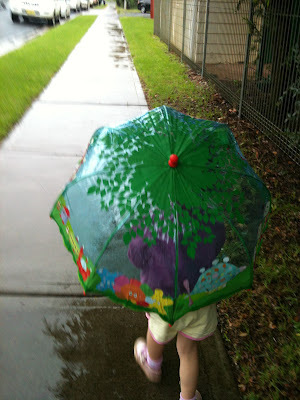 Linking up with Maxabella at Village Voices for 52 Weeks of Grateful. 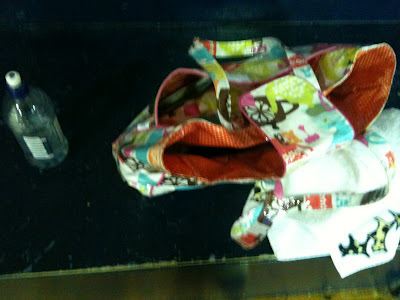 This entry was posted in 52 Weeks of Grateful, Girly Stuff, Sisters on May 25, 2012 by nat. This week has passed in a kind of surreal haze. I seem to have been on a physical and emotional rollercoaster trying to keep up with it all and I have no doubt that when my head hits the pillow tonight it will be lights out for a solid sleep. I know that when you have ‘firsts’ it’s always a big thing, but somehow this week has been action packed with them. We have ridden this roller coaster of firsts as a family, revelling in the little things and being able to share them together as a family. This week has made me realize just how lucky we are, tired but lucky! I will post more details, especially on Bootcamp, later, but for now here’s some snapshots of our week. 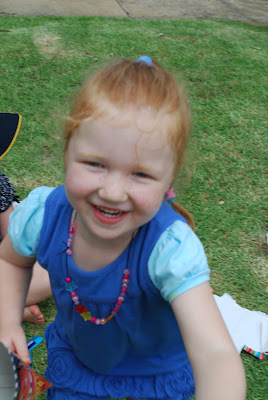 Muddy Pixie started Preschool on Muddy Preschooler’s first sports day! Walking into preschool for the first time! 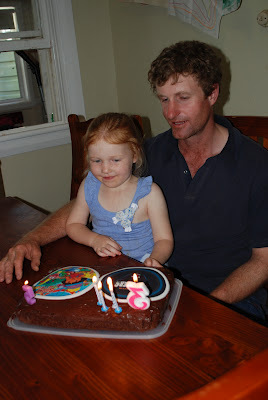 Muddy Hubby and Muddy Preschooler shared a birthday, half a cake each. 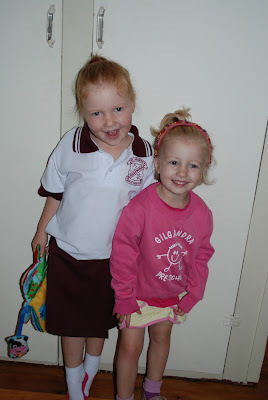 Muddy Preschooler had her first girly sleepover with her best friend! My first Bootcamp! I spent the whole time being cranky at myself for letting myself get this unfit! 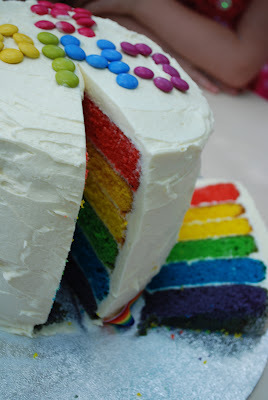 I made Rainbow Cake for the first time! 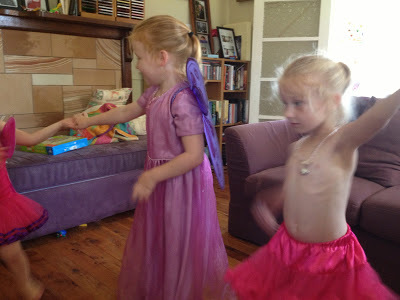 This entry was posted in Muddy Preschooler, Photos, Sisters on February 5, 2012 by nat. 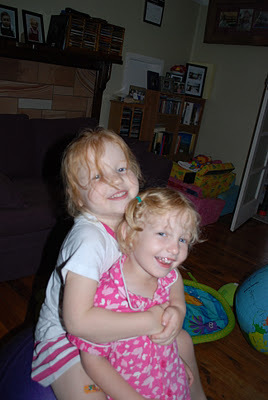 Wordless Wednesday – Nothing like a good sisterly hug! Sorry Muddy Bubby, but brothers give a different kind of hug to what sisters do (and they’d probably squash you too)! 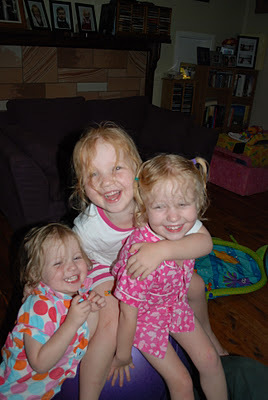 This entry was posted in Photos, Sisters, Wordless Wednesday on January 25, 2012 by nat.